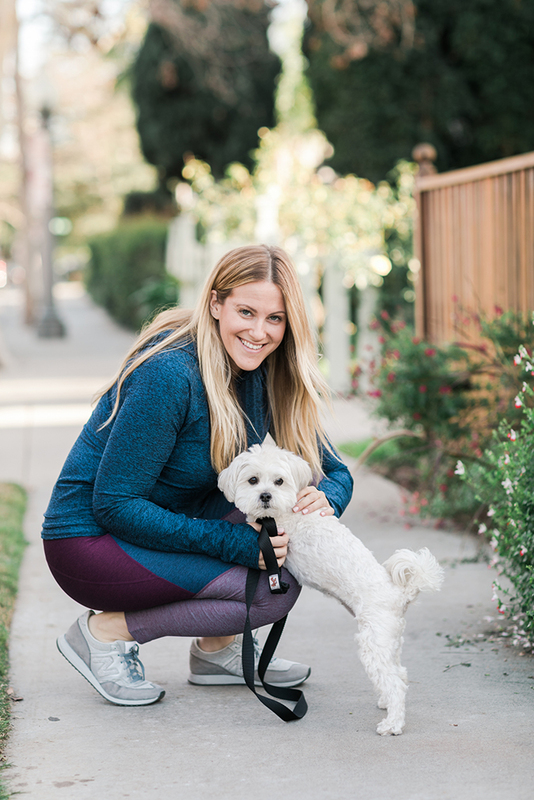 This post is sponsored by one of our very favorite brands for chic athletic apparel, Outdoor Voices! If you were to stop by the LC.com offices on any given day, you’d notice a trend amongst our editors (and no, we’re not talking about the fact that roughly 2/3 of us carry the same Mansur Gavriel bucket bag… although that is true too). We’re all very into our fitness trackers. Whether you’re a total fitness fanatic or just want to stay active, tracking your steps is one healthy habit that all of our editors swear by. Health and fitness experts recommend logging in at least 10,000 steps a day, so we all make that our goal and hold each other accountable. If you choose to tack on a spin class, some yoga, or another sweat sesh on top of the 10k steps, that’s obviously amazing. But even if you don’t make it to the studio or gym that day, taking those 10,000 steps is a totally realistic fitness goal that will keep you moving day in and day out. 1. Park at the first spot you see, instead of circling for a closer one. If you live in an urban area like L.A. where street parking is hard to come by, this is a big one. When you’re driving to your destination, park at the first spot you see as soon as you’re within walking distance. All too often we find ourselves circling the block three times for a closer spot when we could have spent that time sneaking in a few more steps! You may have heard this one before, but for good reason; it’s super effective! Take a pledge to take the stairs instead of the elevator. If your office or apartment is located several stories up, this can make a huge difference on a daily basis. 3. Make your social plans active. Next time you go to schedule a coffee or lunch date with a friend, consider meeting for a hiking or walking date instead. Having a buddy to move with is a great way to make physical activity fun. 4. 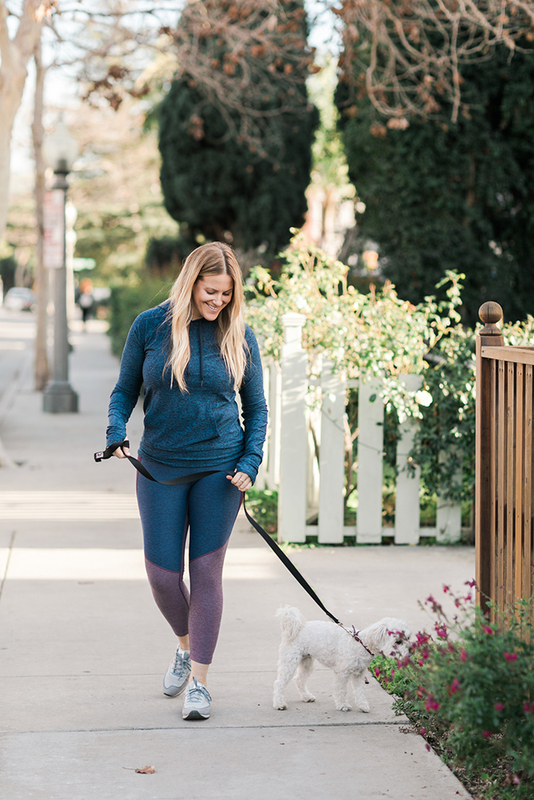 Take your pup around the block an extra time. If you’re a dog owner, then daily walks are probably already a part of your routine. But instead of taking your pup out for a short potty break, challenge yourself to double your normal route. Circle the block one more time to give both you and your furry friend some extra exercise. We’re all guilty of being pretty dependent on Seamless, Postmates, and other food delivery services. And while we love the convenience of having our lunch delivered right to our desk, using these services daily can make for a pretty sedentary lifestyle. Instead, opt for takeout places that are within walking distance and make yourself get up and move for your meal. 6. Make it a walking meeting. Anytime you have an internal meeting or a work phone call that doesn’t require you to be in front of your computer, make it a walking meeting. Especially if you work in a creative field, we find that when your blood starts pumping, the creative juices start flowing too. We’ll take any excuse to go shopping, and this is a good one. Instead of ordering online next time, head to the nearest mall or shopping area to peruse the racks on foot. And if you have a good indoor mall nearby, keep this tip in mind for rain or snow days too! 8. Get to know your neighborhood. We know how hard it can be to say goodbye to the same nail salon or dry cleaner you’ve been going to since you moved to your city. But if you’re no longer living in the same neighborhood, make an effort to get to know the small businesses within walking distance or your current abode. Think of how nice it will be to walk there next time you have an errand to run. If you enjoy a challenge, start a friendly competition with your friends or coworkers. Use your fitness tracker or a pedometer app to see who can get the most steps in a week or month. If you work at a desk like we do, set a timer to make sure you get up and moving every single hour. Even if that means you just walk to the water cooler or go outside for five minutes of fresh air, make sure you are not ever sitting still for more than an hour. To make it all the way to 10k, we’ve typically found that you do have to schedule at least one longer walk, run, or hike during the day. But all of these little tips really do add up. Even if you’re not into “working out,” just sticking to your steps will keep you active and the challenge of having a specific goal makes it fun. It’s a lot easier than you might think and there’s no excuse not to walk even if you’re not a star athlete. 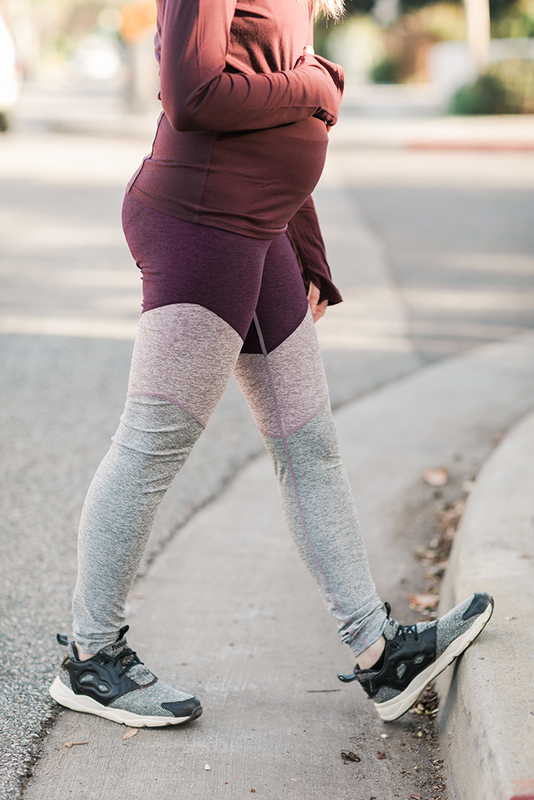 Taking long walks is also a great fitness goal for the mama-to-be! It really is as simple as going on a hike with a girlfriend or taking your pup on a longer walk than you usually do. And now for the exciting stuff… here’s how you can shop our favorite looks from Outdoor Voices! 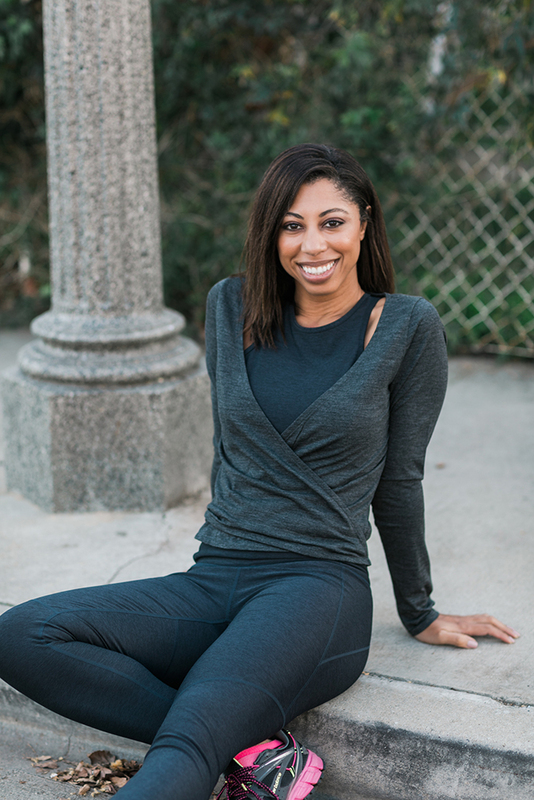 Carmen’s OV outfit consists of the Women’s Warm Up Kit in black paired with a Merino Plié Wrap in charcoal. 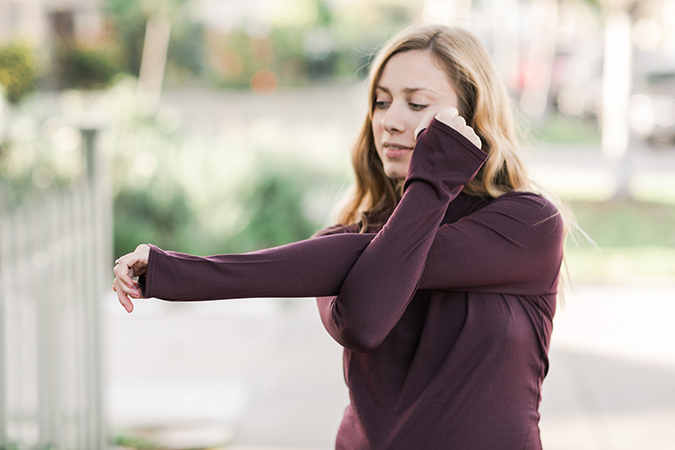 The kit made it super simple for Carmen to makeover her workout wardrobe in one simple step. And we absolutely adore the ballet-inspired style wrap she chose to go over it. 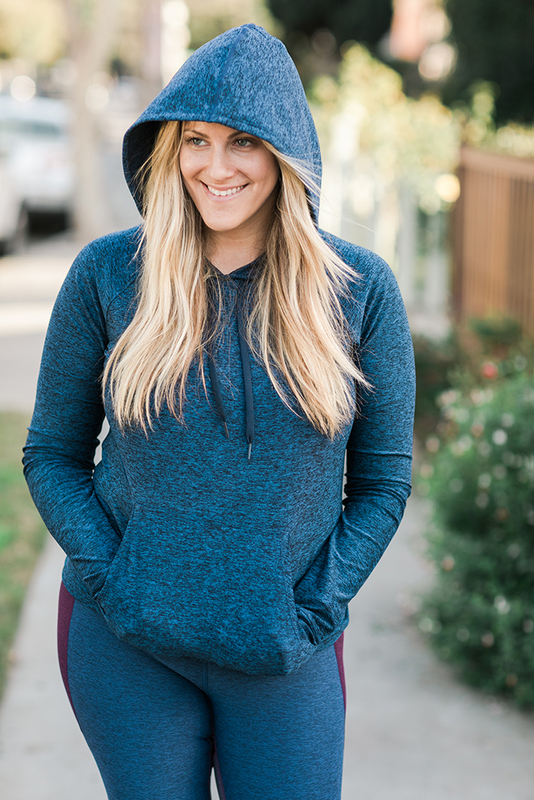 Rachel is wearing the super cozy Catch-Me-If-You-Can Hoodie in navy with the ¾ Tri-Tone Warmup Legging in the navy/plum/gravel color combo. This is a perfect example of OV’s interchangeable pieces that go well together! We hope all these tips and cute clothes inspire you to keep moving and have fun doing it. What other tips do you have for making it to 10,000 steps a day? And which of these Outdoor Voices pieces are your favorite?